• For quantitative determination of glycerol and evaluation of drug effects on glycerol metabolism. • Sensitive and accurate. Use as little as 10 μL samples. Linear detection range in 96-well plate: 10 to 1000 μM (92 μg/dL to 9.2 mg/dL) glycerol for colorimetric assays and 2 to 50 μM for fluorimetric assays. • Simple and convenient. The procedure involves addition of a single working reagent and incubation for 20 min at room temperature, compatible for HTS assays. • Glycerol [Glycerin or Glycerine, C3H5 (OH) 3] is widely used in foods, beverages and pharmaceutical formulations. It is also a main by-product of biodiesel production. Simple, direct and automation-ready procedures for measuring glycerol concentrations find wide applications. 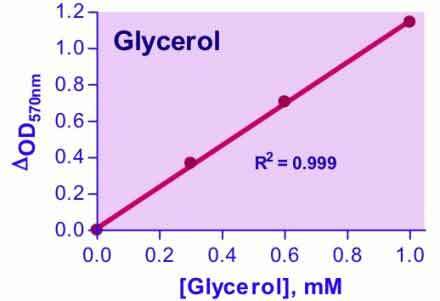 BioAssay Systems glycerol assay uses a single Working Reagent that combines glycerol kinase, glycerol phosphate oxidase and color reactions in one step. The color intensity of the reaction product at 570nm or fluorescence intensity at λex/em = 530/585nm is directly proportional to glycerol concentration in the sample. 1. Lung, M et al (2009). Diacylglycerol kinase epsilon is selective for both acyl chains of phosphatidic acid or diacylglycerol. J Biol Chem 284(45):31062-73. Assay: Glycerol in N/A Diacylglycerol (Pubmed). 2. Drew, BG et al (2011). Reconstituted high-density lipoprotein infusion modulates fatty acid metabolism in patients with type 2 diabetes mellitus. J Lipid Res 52(3):572-581. Assay: Glycerol in Human Plasma (Pubmed). 3. Wachtler, B et al (2011). From attachment to damage: defined genes of Candida albicans mediate adhesion, invasion and damage during interaction with oral epithelial cells. PLoS One 6(2):e17046. Assay: Glycerol in Fungi C. albicans (Pubmed). 4. Bahar, B et al. A potential role of IL-6 in the chito-oligosaccharide-mediated inhibition of adipogenesis (2011). Br J Nutr. 106(8):1142-1153. Assay: Glycerol in Mouse 3T3-L1 cells (Pubmed). 5. Calamita G et al (2012). Biophysical assessment of aquaporin-9 as principal facilitative pathway in mouse liver import of glucogenetic glycerol. Biol Cell 104(6):342-51. Assay: Glycerol in Mouse Plasma (Pubmed). 6. Pifferi, F et al (2011). Mild experimental ketosis increases brain uptake of 11C-acetoacetate and 18F-fluorodeoxyglucose: a dual-tracer PET imaging study in rats. Nutr Neurosci 14(2):51-8. Assay: Glycerol in Rat Plasma (Pubmed).